Tripoli (AFP) - Four people were killed in clashes near the Libyan capital on Tuesday between the Islamic State group and fighters loyal to the Tripoli-based government, a local official said. The four dead men were members of the Sabratha military council which backs the Fajr Libya militia alliance in control of the capital, said Hussein al-Dawadi, mayor of Sabratha, west of Tripoli. Fajr Libya is a coalition of Islamist militias that backs the non-recognised parliament in Tripoli and which is battling IS jihadists who have spread their influence across Libya. Last week a US air strike targeted an IS training camp in Sabratha, killing dozens of people. The Pentagon said a senior IS operative behind attacks in Tunisia was probably among the dead, while Serbia said that two diplomats abducted in Libya were among those killed in the air strike. Dawadi said that fighters from the Sabratha military council launched raids in the suburbs of the city on Tuesday searching for IS militants. 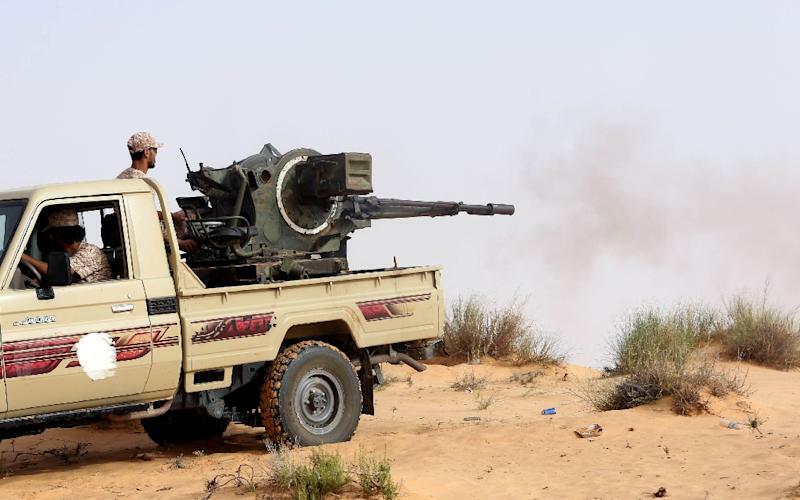 During one assault on a farm in the Al-Nahda area clashes erupted in which four Sabratha military council fighters were killed, he added. The Sabratha military council meanwhile posted a message on its Facebook page urging civilians and medical staff to mobilise and help them battle IS. The oil-rich North African country has had rival administrations since the summer of 2014 when the internationally recognised government fled Tripoli after Fajr Libya overran the capital. IS has exploited the turmoil in Libya since the overthrow of dictator Moamer Kadhafi five years ago, raising fears that it is establishing a new stronghold on Europe's doorstep. Last June, it captured the coastal city of Sirte, east of Tripoli, and has since attacked coastal oil facilities and staged a string of suicide bombings.